Generally speaking, streams that are most likely to contain gold must have four characteristics. 1. They should be Unregulated (not dammed). This factor is important because seasonal floods churns up the minerals found in the stream bed. When this is done during floods, the gold and other dense materials are carried downstream and settle out or fall to the bottom of certain areas first. This concentrates these valuable minerals thus allowing prospectors to find them. A good indication as to whether you are in a mineral rich area is to look at the rocks exposed by stream erosion and within highway cuts. Virtually any place that the rocks show a non-sedimentary layering will probably be an excellent place to look. Mineral layering is very infrequently level. Many times the rock layers appear to bend and incline. Quartz is commonly found in parts of the layering along with feldspar or other identifiable minerals. Consult field identification manuals for a more specific description of these minerals. They are common and can be easily identified with a little research. —>TIP Another indication of a mineral rich area is the presence of black sand. But while placer gold is usually found with black sand the presence of black sand does not necessarily indicate the presence of gold. As discussed earlier, gold is extremely heavy. If the stream in which you are looking is slow moving and flat, the dense material will have settled out upstream. As a meandering stream continues downstream it travels slowly, twisting one way then the next. These river sections will provide you with little success. Rapids and waterfalls and white water are indications of quick elevation drops. Flood will churn up everything in the river’s expanded boundaries. 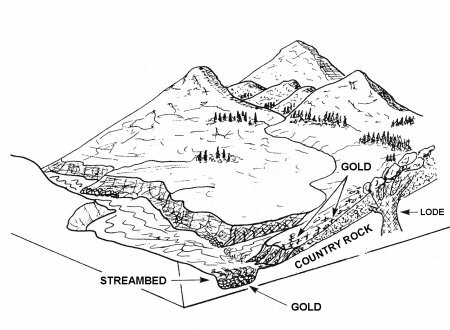 Placer gold settles in specific areas of a stream bed called “paystreaks”. These paystreaks are most often found where the water flow slows down significantly. They may also form along a path, which follows the shortest, straightest route down the stream bed at high water. As flood levels recede, gold deposits can be left some distance above a low, common summer water level. When looking for a good place to search, imagine what the river would have looked like during flood (better yet, if you can, go take a look when it is in flood). Most streams do not travel in a straight line for very long either horizontally or vertically. The inside of the bends, where stream gradient flattens after a steeper run or rapids, are often likely places for pay streaks to form. Look, as well, on the downstream sides of large boulders and similar stream bed obstacles. These create an area where the water will eddy and slow down for a short time. Higher density materials may be concentrated here. Other possible accumulation sites include ridges created by bedrock protrusions and large fallen trees. Such obstacles can be even more productive if they are in that shortest, straightest path down the stream bed described above. Pay streaks may take several years to form so the best obstructions to investigate are those which appear to have been there for a long time. The best rock features to trap dense materials transported during floods are exposed bedrock outcroppings with small, near vertical cracks or fissures. Smooth, well-worn bedrock is almost never productive. Newly formed gravel bars on the inside of river bends and the up-stream ends of mid-channel gravel bars also offer potential accumulations. Although the gold particles found here will generally be small to very fine, there is, sometimes, quite a bit of it. Also, small streaks of gravel laying on the bottom at the deepest part of the stream channel can be promising. (But you will need some sort of dredge to retrieve it). —> TIP: In popular prospecting areas, the large, obvious cracks have most likely been cleaned out previously. But look for lines of moss running along the bedrock. There is almost always a small crack under the moss and these cracks can contain a surprising amount of gold. …and speaking of moss: Moss and grass roots near the riverbank often trap transported gold particles. Look for this combined with other favorable settings or conditions. As a stream cuts deeper into a canyon or incises itself, it can leave patches of gravel higher on the valley walls. These benches are frequently productive. Look also for rounded rocks well above the present high water level. Higher elevation round or rounded rocks have lived in the river at some time in the past. Keep in mind that behind these too are likely places to find gold. There is an old saying: “Gold is where you find it.” What this really means is, you may find a spot that looks perfect and not find any gold at all or you may find a spot that looks like it would be barren but you may find a “bonanza.” Be willing to consider all the possibilities. Bench deposits are found on the banks of a stream, and stream bed deposits are found under the water. You should start your exploration in the stream bed. If you don’t see any signs there, chances are that the entire basin is bare. Look for cracks or crevices in the rock at the bottom of the stream. Gold will settle into them. Any rough or irregular bedrock surface will act as a gold trap. Potholes in the bedrock will trap gold, so dig until you find the hard edges of the hole. Smooth and polished surfaces don’t trap gold well. Dikes or bedrock extrusions in the stream will trap gold in different ways. If such a feature angles downstream, gold will collect on the downstream side. If it angles upstream, it will tend to collect on the upstream side. Rock outcroppings from the stream or valley banks work similarly. Any sudden drop-off into a deeper and larger volume of water is a good place to look. Boulders at the base of a waterfall will protect gold deposits from being flushed away by the falling water. Sometimes the gold will settle out just beyond the boilout point. If the gradient of the stream bed lessens just downstream, there may be a good sized deposit there. Examine topographic maps for places where the grade changes rapidly. 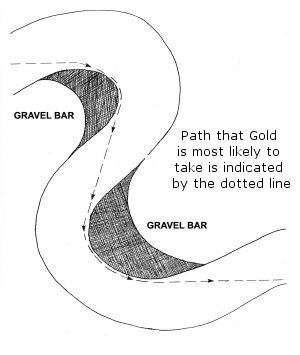 Gold tends to follow the shortest route between bends. Boulders in the stream may trap gold on the downstream side. Of course, if they are in the shortest path, they are even more likely to do so. Look for gold where it has been found before. Doing some historic research during the off-season is an excellent way to increase the odds of finding gold the next time out. There is no sense in wasting your time looking for gold in an area that is known for NOT having any gold. In rivers, gold will concentrate in areas where the water velocity decreases. But, gold moves when the water velocity is high. Therefore, imagine what the water flow would look like AT FLOOD STAGE, and try to identify areas where the water velocity would decrease. Typical areas would be in front of large boulders, on the insides of curves, along the banks, etc. Stand at the “upriver end of an inside curve” on the river. Look up river to the previous curve, which should be on the opposite side of the river and draw an imaginary line from where you are standing to the upriver curve. Look for a series of large boulders along this line. Dredge this line of boulders, checking to make sure when you are in this potential paystreak. When dredging a section of the river that has deep bedrock, work the clay layers as if they were bedrock. Generally, gold will be located within the top 6″ of a clay layer. If you penetrate deeper than this, you will have to go to the top of the next clay layer to find additional productivity. Look for areas where bedrock is shallow, and look for areas that will trap gold; cracks, rough or broken bedrock, and large boulders. Always look for places that would have decreased water velocity at flood stage. To find areas of shallower bedrock (compared to other areas of the river) when exposed bedrock cannot be seen, look up both sides of the canyon for exposed rock jutting out from the surrounding terrain directly across from each other. Draw an imaginary line down one side to the other, joining the two outcroppings. Where this line crosses the river will be the area of shallowest bedrock. Due to the weight of gold, it tends to settle “down.” So, look for natures riffles. Cracks or fissures in the rock which forms the creek or river bed may be scraped out with a screwdriver, knife, tooth brush and the like. Weeds also grow out of the cracks in bed rock, so don’t forget to pull weeds and wash the dirt from their roots as part of any “concentrate”.